St Thomas is the second largest and most sophisticated of the Virgin Islands, and is an extremely popular port for cruise ships. There's a strong Danish influence which is especially evident in Charlotte Amalie, the main town and capital. 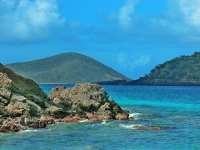 Being the most accessible of the islands also means it is the most heavily developed and visited, with visitors from around the world attracted by the town's reputation as an international shopping Mecca and cruise hub. It is also scenically beautiful, with numerous headlands, coves, and forested hills providing stunning vistas over the Caribbean. St Thomas also has some of the best white-sand beaches in the region. Magens Bay Beach, on the north coast, is acclaimed as one of the finest in the world, and the sparkling waters and coral reef of Coki Bay are superb for snorkelling. Fabulous panoramas can be viewed from Drake's Seat, a high point in the centre of the island from where Sir Francis Drake used to watch for enemy ships. Combining natural beauty with first-rate amenities, St Thomas offers numerous activities on and off the water, a variety of accommodation including fine hotels, and good international cuisine.